Philitas of Cos, or just Philitas, was an ancient Greek scholar and poet; in fact, as far as is known, he was the first person to be called “poet as well as scholar.” Little is known of Philitas’ life. Ancient sources refer to him as a Coan, a native or long-time inhabitant of Cos, one of the Dodecanese islands in the Aegean Sea. Philitas created one of the first dictionaries, or glossaries (Átaktoi glôssai), and gave it the fantastic title, Disorderly Words; it explained the meanings of rare Homeric and other literary words, words from local dialects, and technical terms. Sadly, this work, along with most of his poetry, has not survived the ages; only fragments and commentary about it remain. Stranger, I am Philitas. The lying word and nights’ evening cares destroyed me. You could say that this Coan lover of paradox had become his own koan — “a paradoxical anecdote or a riddle that has no solution; used in Zen Buddhism to show the inadequacy of logical reasoning,” says OneLook. Whatever the questionable value of that pun (and I might as well throw the Coen brothers into the mix, for extra extra punishment), we have added a small morsel of information to our paltry knowledge of St. George Stock, who I wrote about recently (Who was St. George William Joseph Stock?) and who we’re still looking for among the shadows of history. One last little anecdote about Philitas, from Wikipedia: “The 3rd century AD Roman author Aelian skeptically passed along a story that Philitas was so thin that he put lead weights in the soles of his shoes to avoid being blown away by a stiff wind.” Probably just a little Roman humor at the expense of a Greek, but it does make for a great image. 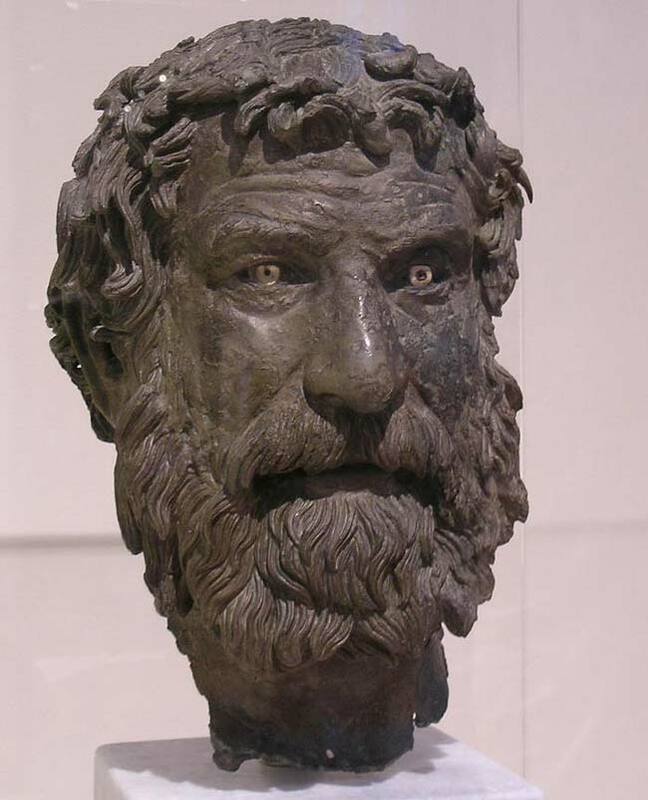 The Philosopher (c. 250–200 BC) from the Antikythera wreck illustrates the style used by Hecataeus in his bronze "gloss" of the "glossarist" Philitas.